The “Tretyakov Gallery Magazine” and Garage Museum of Contemporary Art have been collaborators since the latter’s opening, with articles on the shows of Antony Gormley and Mark Rothko, and the exhibition of works from Frangois Pinault’s collection appearing in these pages. Co-editor Natella Voiskounski met with Garage Chief Curator Kate Fowle recently to discuss Garage’s Louise Bourgeois exhibition - one of the major events of the past exhibition season, which introduced Moscow viewers to the artist’s works from the last two decades of her life. Bourgeois was among the very few artists who represented both modern and contemporary art - she belonged to the 20th and 21st centuries equally, both chronologically and artistically. Better known as Iliazd, Ilia Zdanevich (1894-1975) contrived to remain at the forefront of the avant-garde all his life. From his youthful efforts to his more mature work, through middle age to old age, he was always at the very epicentre of the avant-garde. During his long lifetime - Iliazd lived to the age of 81 - art movements came and went with dizzying speed, with avant-garde styles in a constant state of flux, appearing, disappearing, reorganizing, merging, changing names. The most consistent figure of the avant-garde, Iliazd was something of a living monument - and he was our compatriot. As the exhibition "Iliazd. 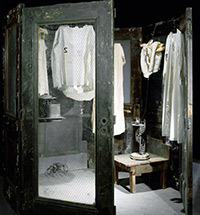 The 20th Century of Ilia Zdanevich" runs at Moscow's Pushkin Museum of Fine Arts, curator Boris Fridman recalls a unique figure in 20th century culture. ORGYEN TOBGYAL RINPOCHE, UPON ARRIVAL IN MOSCOW, GAVE AN INTERVIEW TO NATELLA VOISKUNSKI, CO-EDITOR OF THE "TRETYAKOV GALLERY" MAGAZINE. The New York Jewish Museum's show last year, "Collecting Matisse and Modern Masters: The Cone Sisters of Baltimore", proved breathtaking. The exhibition displayed only a small part of what has been called "a collection of collections" of exquisite paintings, graphic works, prints, sculpture, furniture, embroidery, rugs, and textiles. But the core of the collection, its pride and glory, is Matisse, whose portraiture, still-lifes, sculpture and landscapes were on view. The exhibition told the fascinating story of the two sisters who, led by a female instinct for buying beautiful and often useless — or at least unnecessary — things, developed a perfect taste for genuine art and became distinguished collectors of 19th- and 20th-century modern European art. "A thing of beauty is a joy forever," wrote the British poet John Keats, and once the Cone sisters had experienced the joy of art, they cherished this sublime feeling throughout their lives. The exhibition "Boris Kosarev: Modernist Kharkiv 1915-1931" at the Ukrainian Museum in New York explores the destinies of Kharkov modernism through the life and artwork of one of its most pre-eminent figures. The tally of years, as on a tombstone, defines the brief period of the development and flourishing of modernism in Kharkov. Everything was destined to be called "new" in the New World – New York, New Hampshire, New Jersey, not to mention New England and New Britain. To balance all this newness something needs to be old as well, like Old Lyme, where the Florence Griswold Museum – a landmark institution of Connecticut – is located. The Museum is also called the "home of American Impressionism" as a great many of America’s Impressionists enjoyed the warmhearted hospitality of the really vivacious Miss Florence Griswold. Her home became their home from 1899, when she opened the doors of her late Georgian mansion to artists. Soon a boarding house was turned into an artists’ colony centered around Miss Florence – "a born hostess, with that lovely air and remarkable gift of making her guests feel that it was their home, and she was visiting them". That was how Arthur Heming, the artist who was a member of the colony for ten years, described his impression of Florence Griswold in his book "Miss Florence and the Artists of Old Lyme." It was she who managed to make the brotherhood of artists a most famous summer art colony in America. The exhibition “On Line: Drawing Through the 20th Century” was quite a notable event in New YorkÕs MOMA 2010-2011 calendar not so much because of the eye-catching works on display, but rather, for its cognitive value. The title given to it says much to an attentive and interested viewer who would recognize KandinskyÕs essay with the same title; besides, it uses a term from the Internet, a kind of a homonym that is familiar to everybody. The second part of the title marks the scope of the introduction within a century-long period of transformation of drawing, its “groundbreaking history of an art form”, starting with revolutionary innovative processes at the beginning of the 20th century and following its development along the same lines up to the present day; it is formulated by “pushing the line of drawing into real space, expanding its relationship to gesture and form and invigorating its links with painting and sculpture, photography and film, and, notably, dance and performance”. The Spring 2010 exhibition “Alias Man Ray: The Art of Reinvention” at the Jewish Museum in New York was a highlight of the city's artistic season, revealing in particular the artist's Jewish identity. Man Ray, later titled a “prophet of the avant-garde” in America, was born Emmanuel Radnitzky in 1890 in Pennsylvania, the eldest child in a Jewish family of Russian origin. Emmanuel was nicknamed “Manny”, and from 1912 onwards, when the Radnitzky family took the surname Ray, he began to use “Man Ray” to label himself as an artist; while never completely rejecting them, he nevertheless came to free himself from his familial roots. As Man Ray he concentrated on building up an artistic identity which found its realization in creative photography, the visual arts, film-making, poetry, literature and philosophy. Richard Serra is undeniably a great name in contemporary art. Each of his installations or exhibitions is considered a major artistic event. Serra’s sculpture is associated with a certain laconism in form, as well as minimal plastic means aimed to reach the maximum of expression. His multi-tone self-supporting steel installations are the result of a new sculptural mentality and reveal a novel semantics in sculpture. “Crossroads: Modernism in Ukraine, 1910–1930”, the first major exhibition of early 20th century Ukrainian art was shown in Chicago at the Chicago Cultural Centre, and in New York at the new Ukrainian Museum. Featuring the best of high modernism from Ukraine, the exhibition included more than 70 rarely seen works by 21 Ukrainian artists; each of the works was shown for the first time in the United States. The avant-garde, art nouveau, impressionism, expressionism, futurism and constructivism movements were presented in a new light. Americans – the general public and art critics alike – were equally enthusiastic about the exhibition. The Israeli artist Lora Verhovsky’s exhibition of largesize artworks made of leather and suede in the Museum of Applied Arts was a success – with numerous articles in the press, and sincere appreciation from Muscovites and visitors to the Russian capital. Thus the exhibition “Revival” enjoyed no less popularity than in Israel, and at least one of the attractions was the technique – the so-called “leather intarsia”. Alexandre Gertsman, prominent New York art dealer, collector and founder and president of the International Foundation of Russian and Eastern European Art- INTART- has chronicled the post-Soviet “moment” through numerous museum and university exhibitions, cultural festivals, symposia, and lectures across the United States, Europe and Russia, with documented complementary books and catalogues of the artists represented. INTART offers a unique opportunity as a representative of both prominently established and lesser known, beginning Russian artists, whose collective experience invariably extracts varied response and discourse, promoting cross-cultural communication. Modern culture – and modern art, in particular – has encompassed the term “re-actualization”, which refers to cases when a phenomenon or genre is taken out of the archive and presented to the cultural community in a new light, with new meanings and a new functional orientation. The unprecedented exhibition of Russian art labeled precisely and appealingly “RUSSIA!” that opened in New York’s Solomon R. Guggenheim Museum in mid-September has inspired great interest from the West in Russian art, and stimulated similar interest from the Russian side in the Guggenheim museums, particularly the Guggenheim-Hermitage Museum (Las Vegas); it is the only one of the five Guggenheim museums directly associated with Russia – and the contact is with one of the internationally most famous Russian museums. The exhibition “The Body. Art and Science” proved a major attraction in Sweden this Spring, with its eternal, allembracing search for a distinctive identity finding brilliant and eye-catching realization at Stockholm’s National Fine Arts Museum. Its curators and contributors to the catalogue (published in Swedish, with an English summary) included Torsten Weimarck, Merten Snickare, Eva-Lena Bengtsson, Ove Hagelin, Mens HolstEkstrum, Karin Siden, Ulrika Nilsson, Eva Ehren Snickare, Solveig Julich, and Ingela Lind. The two forewords to the catalogue were written by Solfrid Soederlind and Jan Lindsten. Generous contributions from museums and private collections from the Netherlands, Germany, Russia, Great Britain, France, Poland and Denmark to the exhibition made the result a major international project. 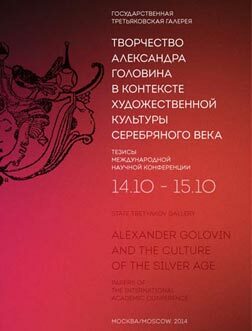 In May 2006, the Tretyakov Gallery will celebrate its 150th anniversary. As the years pass, we find ourselves cons tant l y re turni ng to Pav e l Tretyakov and his vital role in the development of Russian art. A successful merchant and ent repreneur, Tre t yakov claimed that “assembling the Russian school, as it is today” was one of his life’s goals. 150 years later, we still remember Tretyakov with immense gratitude, such was his gift to society and future generations. “In a school of fine arts, it is one’s duty to teach only uncontested truths, or at least those that rest upon the finest examples accepted for centuries." H. Flandrin’s words, are the closest we come to articulating a mission statement at The Florence Academy of Art. With Flandrin, and so many others we could quote, as our guides, we teach the craft of working in the realist tradition similarly to how it was taught in the 19th century ateliers of Western Europe – not so as to produce 19th century work, but because... our most direct link to the traditional values and teachings of the past, which are known to have produced professionallevel artists in the realist tradition, are through those studios. Because I picked up pieces ot the tradition from many different people, what we teach at the Florence Academy is a blend of what I received from many of those I mentioned earlier, necessarily interpreted in my own way.